It is not just Google that is investing in clean tech these days. Green energy startups are cleaning up on Sand Hill Road as well. The National Venture Capital Association and Thomson Financial put out some figures today on the amount of U.S. venture capital going into clean tech startups—some of the startups are overseas, but the money came from U.S. firms. (You can download the full release here). 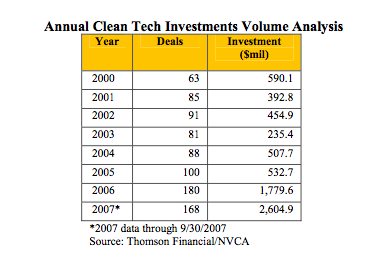 During the first three quarters of 2007, VCs poured $2.6 billion into clean tech startups, compared to $1.8 billion for all of 2006, and a mere $533 million in 2005. So far this year, VCs are putting two-thirds as much into clean tech as they are into Internet startups. To put this into perspective, for the first three quarters of 2007, clean tech investments represented 10 percent of all venture fundings, compared to 15 percent for Internet investments.